Grooveshark is getting it from all angles. Not only did its only major label deal (with EMI) collapse, but the company is now being sued by all four major labels for large-scale copyright infringement due to its policy of letting users upload music into its system, where over 30 million people stream it for free each month - mostly in the absence of licenses from artists, labels, and publishers. On Friday the 13th, things took another turn for the worse, as TuneCore's opinionated Jeff Price - who made his name signing the Pixies in the '80s, whose company distributes independent music to iTunes and elsewhere, and who himself has no love for major labels - launched a diatribe against the company. "Grooveshark is a fish rotting from the head down," he claimed. "The people running it are immoral and could [sic] care less about who and/or what they hurt as long as they make money. They make the major labels look like saints. From my perspective, there is no possible way anyone could seriously work at that place and state they truly care about musicians and songwriters, unless they are so delusional or drank so much of their own Kool-Aid they lost touch with reality." 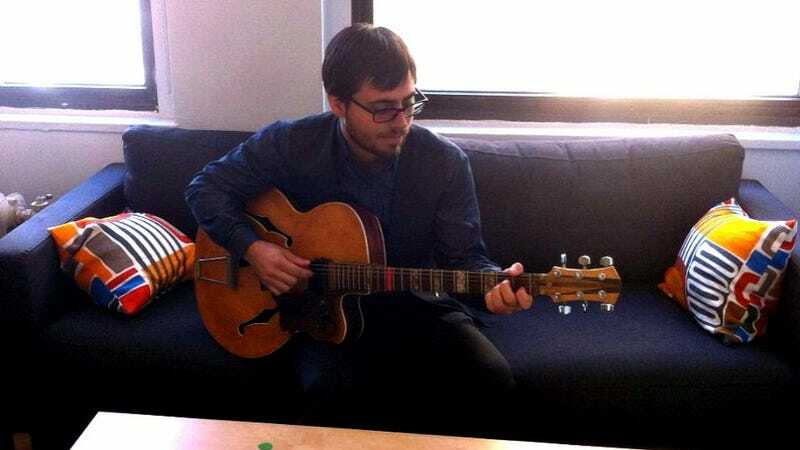 On that same Friday, I walked in to the Manhattan office of Grooveshark CEO and co-founder Sam Tarantino to find him strumming a guitar. He had agreed to be interviewed by Evolver.fm about why what his company is doing is not "dodgy," in the word of a friend who recommended we not put together a playlist for Grooveshark because it would look like we were endorsing a company that didn't respect copyright or musicians. Grooveshark is available as a web app, and as a universal HTML5 app for just about any smartphone. The downloadable iOS and Android apps were banned from iTunes and Google Play and are absent from the other stores. According to Tarantino, Grooveshark employs over 60 people in Gainesville, Florida, and 16 in the New York office where we met, most of whom are in the advertising division. Grooveshark CEO Sam Tarantino defended the approach of the company he dropped out of college to co-found at age 19 in 2006 with his friend Josh Greenburg for nearly an hour, before he took a train to catch a plane. Grooveshark was initially set up to be a service for helping users sell used digital music to each other, deleting the music from the seller's hard drive as it was sent to the buyer, according to Tarantino. But when the iPhone came out, he quickly became convinced that the future lay in streaming music rather than downloading. "That's when it started to grow virally," said Tarantino. However, that shift would ostensibly require licensing from the labels, unlike the plan to sell used digital music. Around that time, he and Greenburg considered moving their budding startup from Gainesville, Florida to Silicon Valley. They did not, in part, because they considered licensing music from the labels to be too expensive. According to Tarantino, the labels are focusing on the wrong business (recorded music) at a time when the money is shifting to live events. Of course, decades of recording contracts exist built around the idea of artists selling their music to labels so that labels can ostensibly try make both parties money by selling that music. Nobody can blink and make those go away. But in Tarantino's mind, the business nonetheless needs to evolve away from the sale of recorded music, the sooner the better. Contrary to what TuneCore's Jeff Price argued, Tarantino claims he sees things from the artist's perspective - and that, for those artists, recorded music is pretty much a wash anyway. I've always looked at this problem from the musician's angle. Did you see the Bieber numbers recently? They split the royalties for the song ‘Boyfriend,' the fourth-best-selling download of all time. You look at the splits and it just doesn't make sense: $390,000 to the label, which makes sense; $200,000 to iTunes; and only $83,000 to Bieber, with a couple of songwriters that get around $2,000 per year. Then you look at Bieber's tour. It's like $52 million. I'm thinking about this, going, ‘If the fourth-best-selling download [has the] artist making sub-$100,000, and there are probably deductions [to recoup the advance from his label], something's not right here.' The distributor, iTunes, is making twice as much as the artist… and yet the tour is making over $50 million. It's clear that in ten years, the incentives are going to align so that music should be free, because it's going to sell everywhere else. Why should the music industry as a whole care whether or not the walletshare comes from a tour with a $100 ticket or $100 in CD purchases over the year? In the end, it doesn't matter. As mentioned, Tarantino thinks the entire music industry must and will shift to 360-degree deals, in which artists sell not only their sound recordings and some of their publishing rights, but also a portion of their live show receipts, merchandise, and sometimes branding opportunities to labels. In return, labels would offer larger advances, and ostensibly spend more time developing the artists because they would have a stake in them that extended beyond the sales and subscriptions of their recorded music. The core problem that the labels have, and I'm not necessarily ragging on them because I understand the history of it and why it's been a scary thing: MTV screwed them over, Apple screwed them over [and] it's always been this sort of contentious relationship with technology. It's understandable. But fundamentally, imagine if they'd diversified their business into starting to buy promoters back in 2000. EMI is the smallest major label. That $2.5 million would look more like $25 million if all the labels were involved. Covering that would require Grooveshark to raise more venture capital money, although according to Tarantino, it was able to pay EMI using its only cashflow from advertising and didn't have to tap into its venture capital investment, which he says totals below $4 million to date. Again, the problem in his view comes down to labels asking for too much money, because he thinks they see more value in recorded music than the market will bear. Meanwhile, investors would be reticent to fork over $25 million only to see Grooveshark turn around and hand it to the labels, leaving Grooveshark with no option to secure licensing now that it has over 30 million monthly users (nearly twice as many as Spotify). It's not piracy, per se, that's killing them. It's the fact that they haven't been able to build artists effectively and then monetize them around the ancillary revenues. Look what they're doing with Vevo. Free music already exists: It's YouTube, it's Vevo. Legally, I can get any song I want off of YouTube right now, so it's just funny to see their perspective on it. ‘Why are you supporting Vevo when you're so aggressively attacking us?' Somehow it just doesn't make sense. The entire idea behind Grooveshark is to do what YouTube did, and still does (albeit with licensing): allow people to play just about any song as quickly as possible. And while you won't find any Beatles songs on Grooveshark (one of the only bands it seems to filter out, rather than waiting for cease-and-desist notices), the Beatles are in fact all over YouTube, as he claims. Look at YouTube and search ‘Beatles,' and every Beatles master is up there, and I know from a fact - from having screaming matches with the EMI guys - that Beatles isn't supposed to be anywhere except for iTunes. So, it's easy to demonize us, but here's YouTube doing the same things - but they're Google, so how can they be illegal? Because Grooveshark includes almost all music for which it has no license, the company relies on the DMCA's "safe harbor" clause, designed to protect ISPs and operators of user-generated sites when their users upload infringing material. Companies like Grooveshark need only comply with those takedown requests in order to be legal, which is what infuriates the company's opponents (and Jeff Price). We have six people - what the law says, and what we abide by down pat because we modeled this off of the YouTube situation, is that you don't even necessarily have to build a filtering system [to stop certain music from being uploaded]. You just have to know exactly when somebody sends you a takedown notice, and you have to give them the benefit of the doubt [that they own the copyright to the song], so that's what we do. We get takedowns that aren't even official DMCA takedowns that we still take down. We block users' ability to upload on the first [takedown notice], and you're supposed to ban users on the third. We've gone a little bit above and beyond what's required by the DMCA, but still, when you're growing fast, there are any number of new users who don't know the rules. And it's those users who tend to fill in the gaps in Grooveshark's catalog as soon as they appear due to a cease-and-desist notice, which is why you can find just about anything (except the Beatles) on Grooveshark. To demonstrate to the labels that they should abandon the idea of selling music, and instead use recordings to promote show tickets and other ancillary revenue streams, Grooveshark is trying to show what it can do to promote 15 or so bands on its service as a sort of proof of concept. So with the engagement ads, we started with the Quiet Company video, and we're doing this with 15 other artists. We drove half a million views within three weeks to the Quiet Company video, and it had like a thousand hits before that. If we're at 10 times our current scale, it means we can drive five million views in three weeks. That's insane. The big thing I see as an opportunity is that plenty of venues are sitting there unfilled. Consumers are obviously willing to shell out for bands they love to see them live. And what that requires is free music to build these eyeballs up as much as possible. It's not just music, either - it's everything. Old media thinks of things as restrictive. ‘How do we have a release date and not give anything until that release date? How do we not give everybody an exclusive?' Whereas in the tech world, it's always about scale: ‘How do we get this to as many people as possible?' It's a very different mindset that has created this clash between the old and the new. And there you have it: the six reasons Grooveshark co-founder and CEO Sam Tarantino thinks music should be free. In the world he envisions, Grooveshark would make perfect sense - a point he hopes to prove using reason number six. Whether that's the world we actually live in is a different matter entirely.